Making éclairs may be a dream for some but more of a complicated task for others. 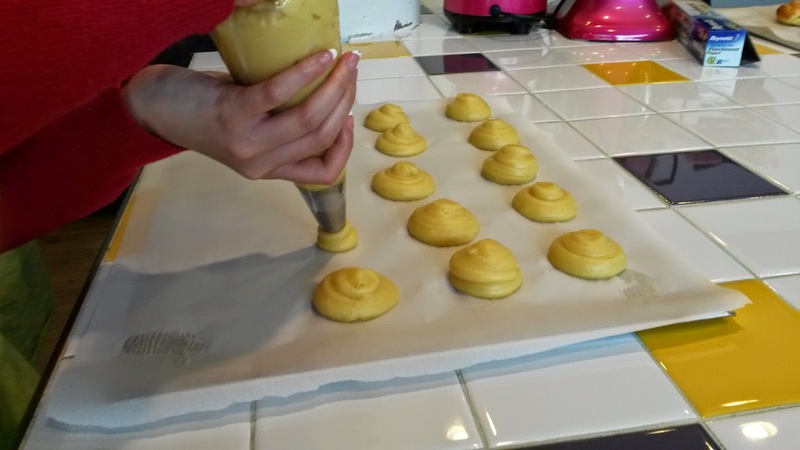 Willing initially to take a class on how to make Saint-Honoré, the grandiose French dessert dedicated to the Saint with the same name who is the patron of bakers, I signed up for the éclairs and Saint-Honoré cooking class at the Paris Eastside School. 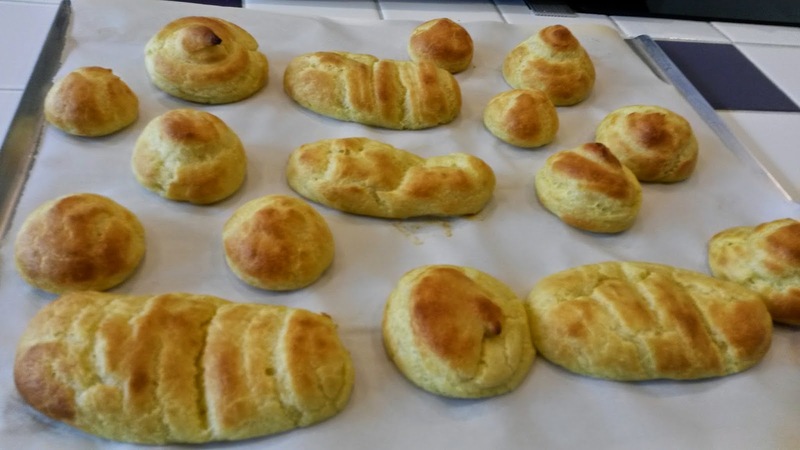 After being welcomed by our instructor and school owner Muriel, we put on our aprons; Muriel didn’t delay the three-hour process of pâte à choux –puffs in English -and éclair making. First is the dough of course, which can be tricky. 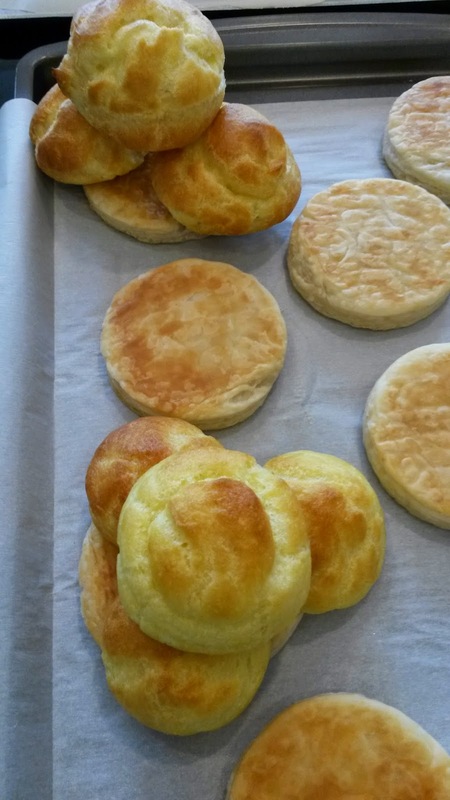 Depending on the humidity, flour responds in different ways. Tip 1: Stick to the basic, all-purpose flour and don’t blend leftovers from one brand or type of flour with another. You don’t know what results you will get and this is not good news. To make the dough, put the butter, the sugar, the salt and the water in a pan, melt them together and put them to boil. When you actually see the rolling broil, dump the flour -set aside in a bowl- and combine them together. Make sure that there are no lumps of flour leftover and then put the entire mix back to the saucepan to dry it out for less than a minute. Then add the eggs, one by one, by stirring them with a wooden spoon. OK, I said, so far so good. Tip 3: Don’t over stir the eggs because the mix becomes too sticky and you don’t want that. Tip 4: If you think that you need more consistency in the mix, you add one additional egg. However, you don’t want to overdo it with the eggs as the dough may become too egg-y. Then you put the dough in a pastry bag with a 16mm tip and pipe it on a sheet of parchment paper; for the puffs, you create rounds, the éclair should be 1.5 inches long (see the photo to get an idea). This is much trickier than you think. Make sure you leave some space between them as they will rise after baking and you don’t want to touch each other. Let them bake for 20 minutes in the oven. The pastry cream or crème pâtissière is another creative thus challenging process but it is tends to be a good exercise for your arms. You put the milk, sugar and salt with the flavor you want –vanilla in our case- together to boil. In another bowl put the egg yolks mixed with equal parts of flour and corn starch; whisk well together without leaving any lumps out, then pour the boiling milk over the mix. Put the mix back to the saucepan and whisk well for some time until it thickens (for the chocolate éclair you also add the grated chocolate at this stage). Then let mix to cool. Once the puffs and the éclairs are cooled off as well as the pastry cream, you literary inject the pastry cream in each of them with the tip of the pastry bag. 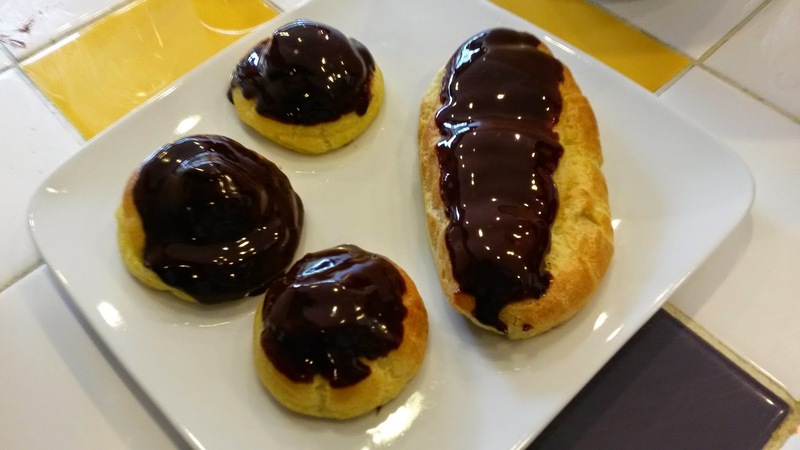 Tip 5: To make éclairs the French way, you have to match the filling (the pastry cream) with the topping –so for chocolate éclairs you need a chocolate ganache or chocolate icing topping and not something else. For the Saint-Honoré you follow the same process really. 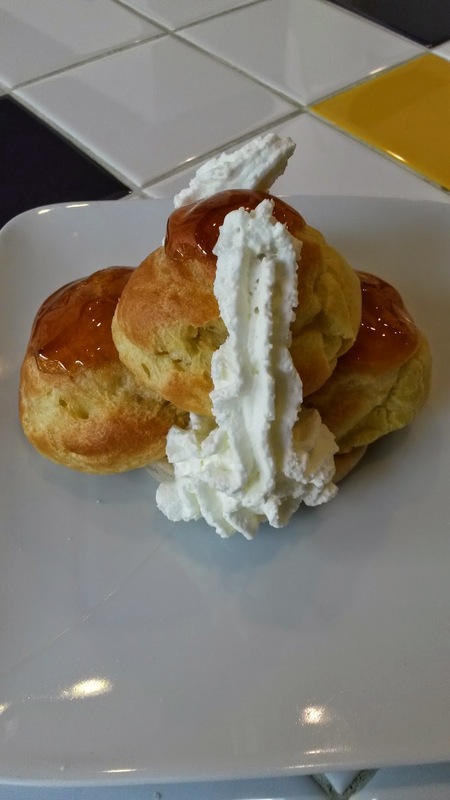 You need three puffs (each has caramel on top) added together on a pastry puff base, and then you add whipped cream. The photo on top witnesses the grandiose element of the dessert. It is for the Saint-Honoré after all. It is a big dessert that obviously needs to be shared with others. For the base of Saint-Honoré: Place circles of puff pastry between two sheets of parchment paper, weight with another cookie pan and cook for 20 minutes. The éclairs and the puffs ended up being soft, fresh and tasty - wonderful for a Saturday lunch that came together with a glass of champagne. I liked both the vanilla cream filled puffs and the chocolate éclairs, each for different reasons. The chocolate has a bold character, the vanilla is softer. Tip 6. 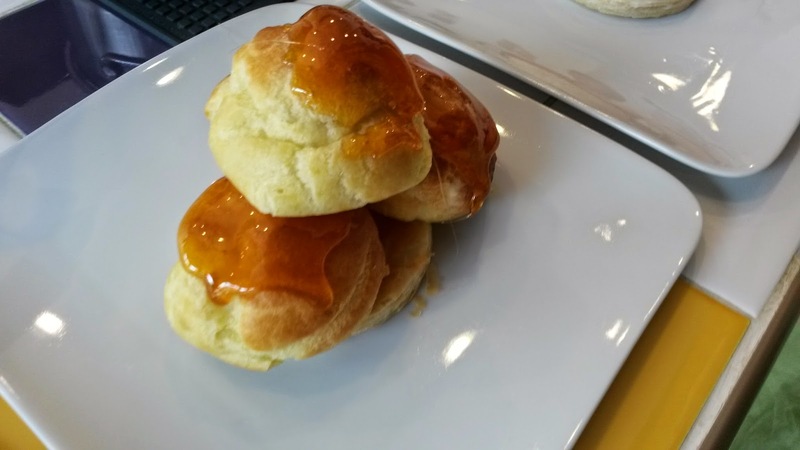 The puff is also used to make profiteroles, beignets and gougère among others. So you really learn something useful that is also versatile. I am glad that I experimented with French pastry making. Now time to practice at home. Kale is one of the ubiquitous leafy greens, the darling of food bloggers, culinary food magazines and top chefs. It is claimed to be loaded with vitamins A, C and K and with minerals like iron, potassium and phosphorus. I started making my kale juice years ago, a hot and humid summer in New York. I just bought some bunches, added cold mineral water, enhanced with almond butter and added drops of maple syrup to bounce off the minor bitter flavor. But as I recently discovered the maple water from Canada, I gave my kale juice a makeover. I replaced the water with maple water and the entire kale juice got a “taste lift”. Here is a very simple recipe for you to enjoy. Tip: Serve it in a flute and let your friends, colleagues or guests to guess what it is or in a retro Coca Cola glass. Put all ingredients into a blender and mix them until liquefied and smooth. You don’t need to add maple syrup because the maple water has approximately 4g of sugar per serving. You can always play around and give the recipe a twist by adding more maple water to make it lighter or more kale for a greener color.